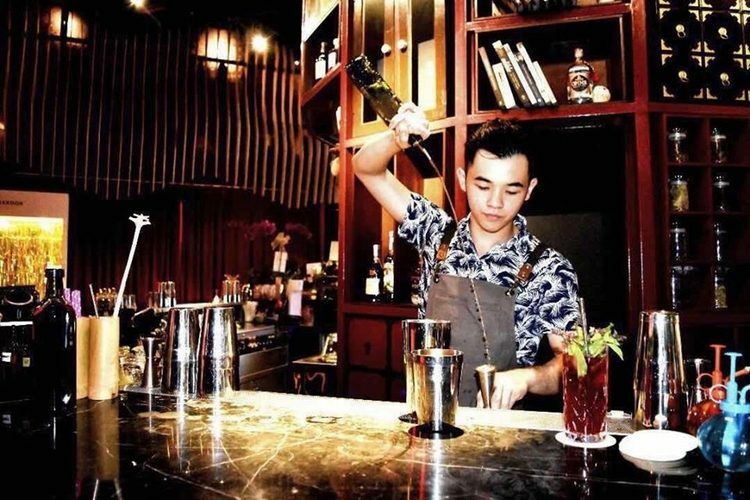 Chris Chung, bartender at Beta KL, shares with The Yum List how he shifted from the kitchen to the bar and some funny stories along the way. When I was young in primary school, I liked to eat and drink in a weird way. For example, my cousin would be having “Ribena” but I didn’t want to have the normal “Ribena.” Instead, I would mix the “Ribena” with “Vitagen” and milk. Another example is when my cousin would have white bread with some butter and sugar I would instead mix the butter with the sugar as a filling and spread it on the bread and finally toast the bread with a little bit of oil in the frying pan. This is what I always did in my childhood and it was really fun. Since in that era we didn’t have smartphones, I found I was quite interested in cooking. When I was in high school, I was a Taekwondo player and at that time my coach asked me to gain weight to increase the muscle from 60kg to 70kg. The eating behaviour was the main point in this process. So I started to cook and prepared healthy meals by myself every day. Instead of eating the steamed chicken breast, hard-boil egg or boiled broccoli, I tried to prepare it with my added creativity. I would bake the chicken with garlic and herbs, make the eggs into a scrambled salad, use a sweet garlic sauce to bake fish and so on. After I finished my high school, I continued my passion and studied a Bachelor of Culinary Arts Degrees in Berjaya University. During my first year in college, I felt that I had to learn and gain more experience in the F&B industry. I did some research and asked for a recommendation from my mentor in Berjaya. My mentor said that Skillet at 163 is a very good place to learn and gain experience but would be much tougher compared with a normal restaurant or café. My mentor mentioned that chef Raymond Tham was the executive chef and was very experienced and passionate about food. I took on the challenge and started my journey in Skillet at 163 as an apprentice for two months. It was very fun and I really learned a lot even though it was tough. After that, I become the part-timer in the kitchen of Skillet at 163. After one year, I returned but this time to their sister restaurant as an intern in the Beta KL bar. At Beta KL’s bar, I met my mentor Harry who was the head bartender of Beta at the time. He was very knowledgeable and experienced. He taught me and guided me from scratch and helped me to find my passion and interest in the bar. After my internship, I was confused if I wanted to work in the bar or the kitchen because I loved both. When I was struggling, chef Raymond gives me a chance to work in the bar and create my own menu using my culinary skill and experience. So now I’m the bartender who always likes to create a cocktail with a culinary background. For me, food and drink are always related. Cocktails can actually be made with culinary skill and be created to combine perfectly with the food. This is how I got into this industry. Share with us an interesting story from behind the scenes. I still remember a very funny moment. It happened in my first week of internship in the Beta bar. A couple from Australia came into our bar and had a Monkey Shoulder with soda. That day when they came in it was almost closing time so they were the only customers. My mentor Harry and I were chatting with them. After they finished their drink the woman started singing around the restaurant. My mentor went out of the bar to pack up the candles from the table but the woman stopped him and held his hand and they danced together! That was very funny to see my mentor dancing! The best part is making new friends with the customers every day. When the customers like my drinks, this is the best reward ever. The other best part of my job is making a customized drink for a guest. I like to do different creations with different flavours when I make every single drink and this will let the customer feel special. The worst part is when customers ask me to make what I like but it ends up not what they like. For example, I like to make an Old Fashioned with chocolate garnish and chocolate bitters but the guest didn’t like chocolate. What’s your favourite drink at Beta? My favourite drink at Beta is my creation – Sweet Dew. It is a twist of a Margarita and inspired by a classic Hong Kong dessert, Yang Zhi Gan Lu, which is made with mango, pomelo and coconut milk. For this drink it is not a normal Margarita, it is a clarified version of Margarita. We use Tequila, Cointreau, pomelo, Curacao and lemon and do a clarification with the coconut milk. This drink is very refreshing with the amazing coconut milk flavour. You drink it with a salt rim that brings out the agave and coconut milk flavour. I serve it with a small petit four inspired by the Yang Zhi Gan Lu as well. The petit four is made with toasted coconut cookies, mango and coconut mousse and topped up with some pomelo flesh. The combination is just nice and unique. What’s one of the scariest things you’ve seen behind the scenes? Going to eat for the whole day, cook some simple home-style food for dinner and pet my cutest dog. Communicating with the customers and making friends with them. Customizing cocktails for guests and making them feel happy and special. Basically is just work, work, work, work, eat then sleep. Another thing we always do in the bar is trying new creations of cocktails, taste cocktails, find how to improve the cocktails, try again, taste again and keep returning. It sounds boring but it is very interesting and fun especially with the team. What’s something you’d like guests to know about Beta? Beta is a very unique place serving modern Malaysian cuisine and cocktails. You may have tasted Malaysian food before but here we do it in a very different way. We like to play with the senses and give the diner a different experience. We do have a cocktail pairing food menu, takes your taste buds to another level. If you like Malaysian food, and you like nice cocktails, you must not miss Beta. What’s your favourite food and beverage pairing? My favourite food and beverage pairing is very simple. Nasi goreng kampung tambah pedas, which means extra spicy fried rice paired with teh o limau ice, which is similar to iced lemon tea. The flavour of the anchovies and salted fish with the hot and spicy kick go with the ice cold sweet and sour tea. This has been a favourite since secondary school. Check out some of Chris Chung’s cocktail creations here.